Fallsview Indoor Waterpark in Niagara Falls has just been awarded a 2018 TripAdvisor Travelers’ Choice Award for the 6th year in a row, recognizing us as one of the top 5 waterparks in Canada! Each year, the Travelers’ Choice Awards are given to attractions and hotel destinations and around the world that are well-reviewed by TripAdvisor travelers. Properties that receive the award demonstrate a strong commitment to customer satisfaction and represent some of the best experiences as chosen by millions of travelers. 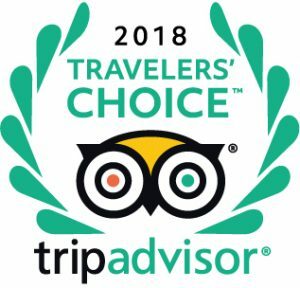 We’re very honoured to receive the 2018 TripAdvisor Travelers’ Choice Award and are always aiming to make our award-winning attraction the best that it can be for families and visitors to Niagara Falls. With 3-acres of fun including 16 waterslides, a 1,000-gallon tipping bucket, full-size wave pool, outdoor activity pool and sundeck, and adult-only Jacuzzis, we offer endless water fun in a one-of-a-kind location! To check us out on TripAdvisor, click here.